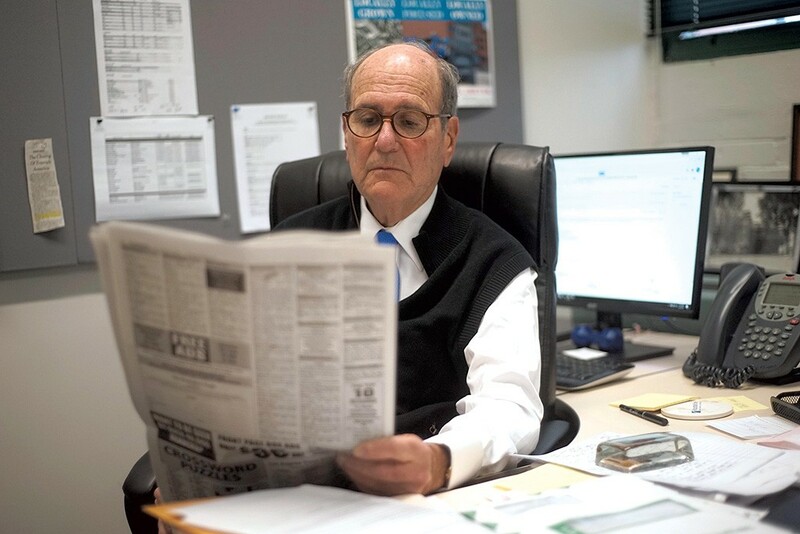 Can a Retired Judge Save Southern Vermont's Newspapers? Kevin Moran could hardly believe his luck last April when he learned that local investors had purchased the group of southern Vermont and western Massachusetts newspapers that employed him. "It's like winning the lottery," the vice president for news told Seven Days at the time. "We spent 21 years or so under corporate ownership. To return to local ownership again is a dream come true, not only for us but, I think, for our communities." Over the previous two decades, a series of national newspaper chains had squeezed every penny they could out of New England Newspapers, Inc., a once vibrant group of papers that includes the Massachusetts daily Berkshire Eagle; the Vermont dailies Brattleboro Reformer and Bennington Banner; and the Vermont weekly Manchester Journal. After multiple rounds of newsroom layoffs and the steady outsourcing of business and production jobs, the papers had become thin and lifeless. But last spring a retired judge from Stockbridge, Mass. — backed by a retired newspaper executive and two wealthy bankers with second homes in the area — scooped up the papers and pledged to rebuild them. "By taking these locally, I think we do have an opportunity to reinvigorate them and make them more responsive to their respective communities," the former judge, Fredric Rutberg, said at the time. Nearly a year later, Rutberg and his partners have started to deliver — particularly at the group's flagship paper, the Pittsfield, Mass.-based Eagle. The new owners have since hired about two dozen new employees — some of whom are doing work previously performed at corporate design hubs in Connecticut and classified advertising call centers in Michigan. They have launched redesigns of the papers' print and online products, replacing the cookie-cutter look favored by the previous owners. Most importantly, they have expanded the Eagle's newsroom with the creation of an investigative reporting team. "This is a dream that came true," Rutberg said last week. That may be so for the Eagle, his local newspaper, but change has come more slowly at the company's southern Vermont papers, which the investors were initially uninterested in buying. David Gartenstein, the outgoing chair of the Brattleboro Selectboard, said he was thrilled last May when the Reformer's ownership changed hands. But a year later, Windham County's sole daily newspaper has just one dedicated, full-time reporter — down from two last year and five a decade ago. "With only one reporter, the depth and robustness of the coverage has yet to be redeployed," Gartenstein said. "They made a lot of promises," said Chris Lenois, a morning host at Brattleboro's WKVT-Radio. "But you're not really seeing a change editorially." Rutberg and his newly hired publisher, Alan English, maintain that they are just as committed to their Vermont papers as they are to the Eagle — and Moran says he's in the process of recruiting a second Brattleboro reporter. "It's early, right?" said English, who left his post as president and publisher of the Times of Shreveport, La., to help reinvigorate the New England papers. "We're taking steps to build those teams back up at this very minute." Given the bleak state of journalism in southern Vermont — far from the state's Montpelier-Burlington media corridor — even the company's competitors are willing to cut the new owners some slack. 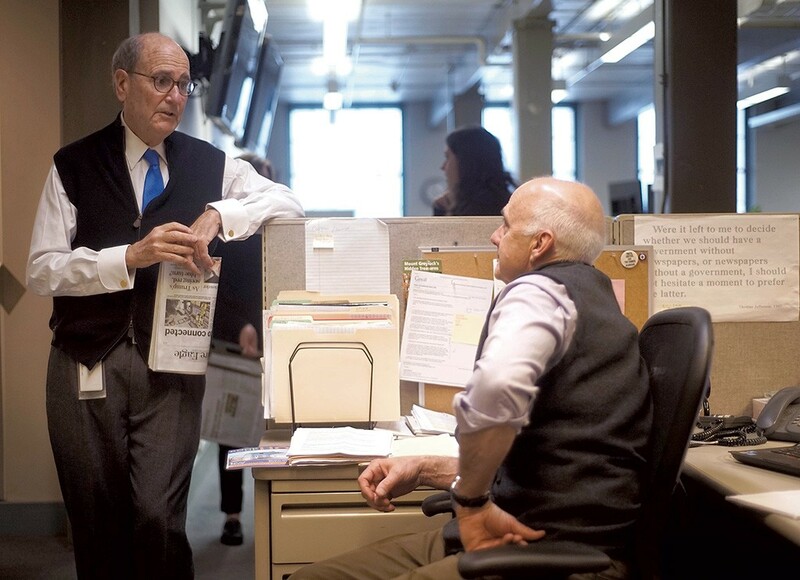 "I mean, you've gotta be either crazy or brave — or both — to buy a newspaper in this day and age, but they seem committed to it," said Randy Holhut, a former Reformer editor who now works for the Commons, a nonprofit Brattleboro weekly. "It's going to take a lot of time to undo the 20 years' worth of damage done by the previous owners." On Nantucket in the summer of 2014, Rutberg and his wife attended a lecture by Time magazine columnist Joe Klein. "He said almost offhandedly that democracy requires citizenship and citizenship requires the town square," Rutberg recalled. "When he said that, my mind focused immediately on the Berkshire Eagle." Four decades earlier, when he first moved to western Massachusetts to practice law, the young attorney had found the Eagle to be "required reading" in town. "If it was in the paper, you were expected to know it," he said. "It lost some of its luster over the years, due to absentee ownership." When he saw Klein speak, the Pittsfield and Great Barrington district court judge was approaching the Massachusetts judiciary's mandatory retirement age of 70. But he still had plenty of energy and was looking for a second act. Rutberg resolved to buy the Eagle and make it the town square once more. His timing was fortuitous. Alden Global Capital, a New York City hedge fund, was looking to unload some 75 daily newspapers and 100 non-dailies it owned through Digital First Media, which was then the second largest newspaper chain in the nation. When a deal to sell the whole company to another hedge fund fell through in May 2015, Rutberg approached Alden about buying just the Eagle. The judge had some hefty financial backing from two bankers with second homes in the Berkshires: former Visa president and Citigroup executive Hans Morris and M&T Bank chair and CEO Robert Wilmers. Rounding out the group was Stanford Lipsey, a retired publisher who has since died. "Each of these guys have said on different occasions that they never, ever wanted to own a newspaper," Rutberg said, referring to Morris and Wilmers. "Except this newspaper." Their business plan was simple: Attract more readers and advertisers by investing in the quality of the papers and the local journalism they produce. "If we don't cover what Donald Trump did today, people will find that out," Rutberg said. "But if we don't cover what happened at the city council meeting, the likelihood of the general public learning about it or understanding it is markedly reduced. That's why we're focusing so much on local." Northeastern University School of Journalism professor Dan Kennedy thinks that's a winning formula — at least for now. "A lot of these smaller papers that really are focused on the community can be sustainable if they can operate without debt," said Kennedy, who is working on a book about a new generation of media moguls. "If they're not trying to squeeze an outrageous profit margin out of them, these papers can still do very well." Rutberg declined to disclose the terms of his group's purchase of NENI, which closed in May 2016 — and he has given conflicting signals about his appetite for expansion. A press release announcing the deal promised "a substantial number of new hires for positions in the newsroom." But in an interview with Seven Days the next week, he appeared to walk that back, saying, "Reporters can act more efficiently." "I'm not committing to anything right now," he said at the time. Among the first people Rutberg consulted when he decided to pursue NENI was Martin Langeveld, who had spent most of his career at the company. "He told me, 'Save your money,'" the judge recalled. "For a while I tried to talk him out of it," Langeveld said. "I would send him articles about the latest numbers in the industry, about the declines of circulation and declines of advertising. I said, 'Why would you want to buy into this business?'" When Langeveld first went to work for the Eagle in 1978 — selling advertising for its short-lived UpCountry Magazine — the paper was one of the best of its size in the nation. A few years earlier, it had won a Pulitzer Prize for editorial writing. "It was a great company to work for," Langeveld said. But after 104 years in the same family, Colorado-based MediaNews Group swallowed it up in 1995 and launched the first in a long series of layoffs and cost-cutting exercises. The situation only worsened after a 2010 bankruptcy and subsequent merger with Digital First Media. In July 2015, following the failed hedge fund sale, DFM cut hundreds of jobs throughout the company, including about a dozen in New England. "Their game is to squeeze as much money out of them on their way down so that their investment is worthwhile," said Langeveld. He lost his own job as publisher of the Reformer in 2008 when the position was merged with the equivalent one at the Banner. Rutberg ignored Langeveld's advice, persuaded him to join NENI's board and, last July, installed him as interim publisher of all four papers. For the next five months, Langeveld worked to rebuild the news outlets whose deconstruction he had witnessed years earlier. The challenges were immense. The company had to quickly replace the business and design functions that DFM and MNG had centralized over the years. At the same time, it moved a printing press from Brattleboro to Pittsfield, Mass., launched an ambitious redesign and switched to a larger, heavier paper stock. According to Langeveld, investment in the company's infrastructure inspired a previously demoralized staff. "People who have been with us are rising to the challenge of doing stories that they wouldn't have had the opportunity to do under Digital First," he said, adding that they were no longer expected to "just get out a paper every day and fill it up with something." According to Moran, "I actually think we're working harder now because I think expectations are higher." Last fall, the papers hired former Daily Hampshire Gazette editor Larry Parnass to helm a new, three-member "Eagle Eye" investigative reporting team. They have charged their editorial page writers with penning more locally focused editorials and taking a more "activist" stance. They relaunched UpCountry Magazine. And they even bought a drone to take aerial photographs of news events. The community — at least in the Berkshires — appears to have taken notice. Local luminaries, such as the cellist Yo-Yo Ma, journalist Linda Greenhouse and author Simon Winchester, have joined the paper's volunteer advisory board. "The feeling is that readership has stabilized, and we're starting to see some growth," Langeveld said. But as he and Rutberg readily admit, the future remains uncertain. Throughout the industry, print advertising revenue continues to decline — and digital has yet to fill the gap. Meanwhile, younger readers are less likely to subscribe to a local print daily. "What we face is what everyone's facing: How do you convince the next generation of readers that you should pay for content?" Rutberg asked. "People who are used to getting it for free have to be shown it's in their best interest to pay." So, is Langeveld finally convinced that his colleagues can make NENI sustainable in the long run? "I think that's where the jury is out," he said. "That is the experiment in this case." After 16 years in the newspaper business and three reporting for the Reformer, Mike Faher was one of the dozen NENI employees laid off in July 2015. A month later, the Commons and the statewide nonprofit VTDigger.org hired him as a shared employee. Digger, an online-only outlet based in Montpelier, was hoping to expand its presence in southern Vermont. And the Commons — formerly a monthly, liberal rag produced by Reformer refugees — was establishing itself as the weekly paper of record in Windham County. Its circulation was approaching 10,000, while the Reformer's had dropped to about 5,000. In an interview that fall, Commons editor Jeff Potter explained that the paper was expanding, in part, to prepare "for what looks like a potential demise of the daily newspaper." That demise never came. On the contrary, after Rutberg and his partners swooped in to save the Reformer — and the Commons faced its own financial crisis — the daily offered last fall to pay a portion of Faher's salary. Now the reporter works for three different news outlets, two of which compete head-to-head. "It's extremely unusual," conceded VTDigger founder Anne Galloway. "But it seems to have worked out beautifully. All three papers seem to be getting what they need — and we're just glad that Mike is still down there." According to Faher, it can be challenging to serve so many masters, but he wonders whether such arrangements may be a solution to the industry's woes. "When everybody's sending a reporter to the same event, why not — if you can collaborate and still retain your identity as a media outlet — why not do it?" he said. Then again, when news outlets choose to collaborate rather than compete, the reader isn't always served, because there are fewer reporters on the beat, and those that remain don't face as much pressure to deliver results. Holhut, the Commons' news editor, argues that while Rutberg and his partners have talked a big game about investing in journalism, in Windham County they have mostly relied on freelancers and Faher. When one of two dedicated reporters left the Reformer last year, she was not replaced. "They're putting out the illusion that there's more stuff in the paper," Holhut said. "But, in terms of actual Reformer content, there's not that much new." According to Moran, of the two dozen hires the new owners have made, only 10 work in the papers' newsrooms — and that counts six new designers and copy editors. In Bennington, the Banner has added two reporting positions in the past year. One of them, currently filled by former Banner managing editor Jim Therrien, is also shared with VTDigger. Ed Woods, who left his post as NENI publisher last July, still lives in Bennington. He says he understands that the new owners' "first priority" is to bolster the Eagle — "the product that generates the most profit and covers the market where they all live." "As a Vermont reader, I look forward to seeing the expansion in print content that they've already offered in Massachusetts," Woods said. Rutberg acknowledges that he still has to make the case to his Vermont readers that they're better off with him than they had been with the chains. "It's a challenge to show the people in Bennington and Brattleboro that we are making the same efforts there that we're making in Pittsfield," the former judge said. "Our commitment is the same. It's just a little more of a challenge for us to deliver." Moran, for one, still feels like he won the lottery. "We've come a long way in a short period of time, and we certainly have a ways to go, I think, before any one of us is satisfied," he said. "But to be able to say that we are better today than we were a year ago is a mighty fine thing to be able to declare in the newspaper business these days." Disclosure: Paul Heintz worked at the Reformer from February 2007 through March 2008. The original print version of this article was headlined "Trial and Error"